"Celebrating over 90 years of history!" Grafton Horticultural Society is dedicated to improving the beauty of the Grafton area. Members maintain four gardens in the community - Wicklow Memorial Park, Haldimand Court Apartments, Town Hall and Grafton Heritage Park. In 2008 the Society created the Grafton Heritage Park in the centre of the village which includes native, rock, woodland and scented areas as well as historical information. Our Horticultural Society was renamed in 2002 to the Grafton Horticultural Society due to the amalgamation of the Alnwick and Haldimand Townships. The original society was organized and named South Haldimand Horticultural Society on April 9, 1925 and then renamed in 1996 to the Haldimand Township Horticultural Society. We rebranded ourselves to Grafton Green Thumbs in 2018. The first President was William Heenan, a local greenhouse operator, and Mrs. J.C. Hutchison the first Secretary. The first flower show was held on August 29, 1925. We have a youth program which has been active since 1969. They currently meet at Grafton Public School in the greenhouse and are fortunate to have been given an area on the school grounds for a garden where we have seven raised beds. Vegetables grown in the garden are donated to Fare Share in Cobourg. Our meetings take place the second Tuesday of the month at St. Andrew's United Church, 137 Old Danforth Road, Grafton at 7:00 p.m. for refreshments and fellowship with meeting beginning at 7:30 p.m. unless otherwise noted. We have interesting speakers, mini shows, two flower shows and a plant sale. Please join us at our monthly meetings and special events. St. Andrew’s United Church, 137 Old Danforth Rd. Refreshments: 7:00 p.m. Meeting begins 7:30 p.m.
"Small Creatures in Our Gardens"
"The Wonderful World of Soil Health"
"Creating/Caring for a Rock Garden"
"Favourite Herbs & Homemade Remedies"
"How Climate Change is Affecting our Flora & Fauna"
"Garden Snippets - Year in Review & More"
Youth awards are presented in October during our Society's regular meeting. The adult competition awards and prizes are presented in December during our Christmas pot luck. The Society's annual programme includes opportunities to share a meal with and get to know fellow members. For a small fee you can enjoy delicious chili supper in January which includes a speaker. There is a summertime pot luck held at a member's home and a Christmas pot luck dinner. 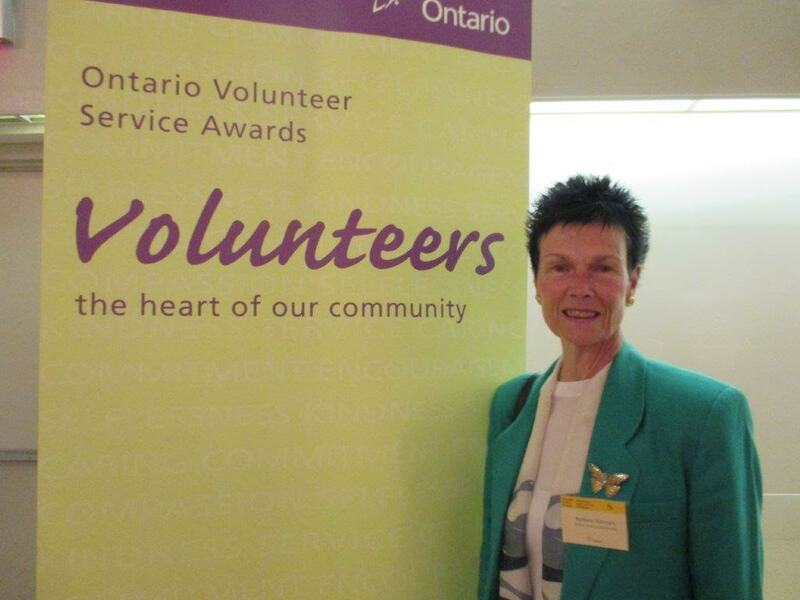 Our Society recognizes the importance of volunteering and nominate members to receive Ontario Volunteer Service Awards. In 2018 Shirley de Nie, Hannah Burgess, Olivia Gibbs and Gail Hoskin received their 5 yr. pin. Marg. Benns and Ivan Moore received their 15 yr. pin. Bev. Silk received her 20 yr. pin. A Society can nominate one person per year for this certificate. A Horticultural Society honour. Criteria includes long time membership in a Society, preferrably a minimum of 15 years, and continued interest in horticulture. Presented at the Annual OHA Convention to one gentleman per year from all of Ontario. Presented at the Annual OHA Convention to one or more people or groups per year from all of Ontario. Presented at the Annual OHA Convention to one or more people per year from all of Ontario. Presented at the Annual OHA Convention to one person per year from all of Ontario. Presented to one person per year from District 4 of the Ontario Horticultural Association. Presented at the District 4 AGM.